In his review of Gardner’s latest works for the Washington Post, Michael Dirda gives a charming rundown of Gardner’s long, involved, illustrious career of being the most math-savvy non-mathematician imaginable. On Saturdays when I was a boy of 14 or 15, it was my habit to ride my red Roadmaster bicycle to the various thrift shops in my home town. One afternoon, at Clarice’s Values, I unearthed a beat-up paperback of Martin Gardner’s “Fads and Fallacies in the Name of Science,” a collection of essays debunking crank beliefs and pseudoscientific quackery, with wonderful chapters about flying saucers, the hollow Earth, ESP and Atlantis. The book, Gardner’s second, was originally published in 1952 under the title “In the Name of Science.” I probably read it around 1962 and found it — as newspaper critics of that era were wont to say — unputdownable. In 1981 as a young staffer at The Washington Post Book World, I reviewed Gardner’s “Science: Good, Bad and Bogus,” a kind of sequel to “Fads and Fallacies in the Name of Science,” and found it . . . unputdownable. A few years later, in 1989, I wrote about “Gardner’s Whys & Wherefores,” a volume that opened with appreciations of wonderful, if slightly unfashionable, writers such as G.K. Chesterton, Lord Dunsany and H.G. Wells. I wrote at much greater length in 1996 about Gardner’s so-called “collected essays” — really just a minuscule selection — gathered together as the nearly 600-page compendium “The Night Is Large.” There I called its author our most eminent man of letters and numbers. By that last word I was alluding to Gardner’s celebrated Scientific American columns devoted to mathematical games and recreations. Written over the course of 25 years, these are currently being repackaged by Cambridge University Press as “The New Martin Gardner Mathematical Library“; the most recent volume, No. 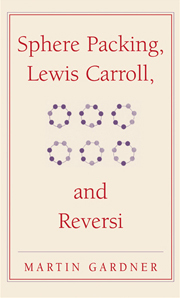 3 of a planned 15, is titled “Sphere Packing, Lewis Carroll and Reversi.” Amazingly, Gardner is largely self-taught in mathematics. And that’s still not all.